Win $100 in Usborne Books! 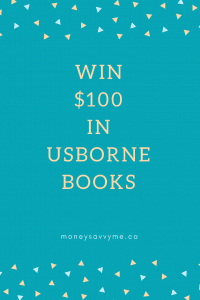 Want to win $100 in Usborne Books? I have just been introduced to Usborne Books and I am in love! These books are seriously amazing! The artwork is fun and age appropriate, just as the content is. Noisy Bottoms? – A story about forest animals fart, and the best part? It has sound effects! See Inside Your Body – This is a flip the tab book with tons of information about the body and its functions. The kids love the diagrams and especially love flipping tabs! There are thousands of titles in the Usborne collection, with topics for just about everyone! Want to win $100 in Usborne Books? Click here to enter! Prev What is the Scanning Code of Practice (SCOP)? Why I’ll NEVER Shop at Newegg.ca Again!